Singapore is bidding farewell to its founding Prime Minister Lee Kuan Yew, who died on Monday aged 91. 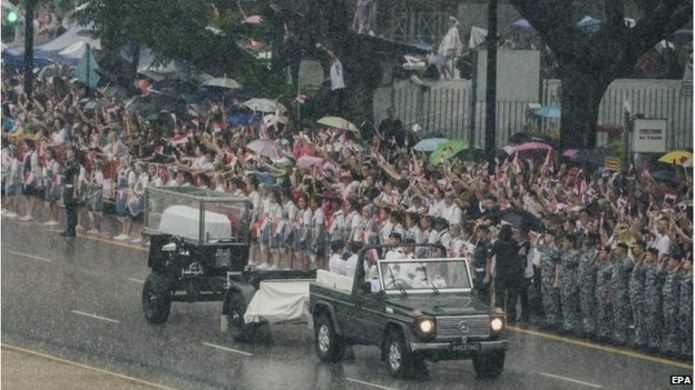 Despite torrential rain, tens of thousands lined the streets to view the funeral procession carrying Mr Lee's coffin through the city-state. A state funeral then took place attended by world leaders, ahead of a private family cremation ceremony. About 1.5m people paid tribute to Mr Lee at sites around the country this week the government said. In his eulogy, Mr Lee's son, the current Prime Minister Lee Hsien Loong, said his father had "lived and breathed Singapore all his life". "The light that has guided us all these years has been extinguished," he said. Media caption Lee Hsien Loong: "The heavens opened and cried for him"
The funeral procession began on Sunday at 12:30 (04:30 GMT) as Mr Lee's body was taken from Parliament House on a gun carriage. A 21-gun salute sounded, echoing across the city, as the procession moved on into the business district and Tanjong Pagar, the docklands constituency Mr Lee represented for his whole political life. Military jets flew overhead while two Singaporean navy vessels conducted a sail-past of the Marina Bay barrage - the massive water conservation project spearheaded by Mr Lee. 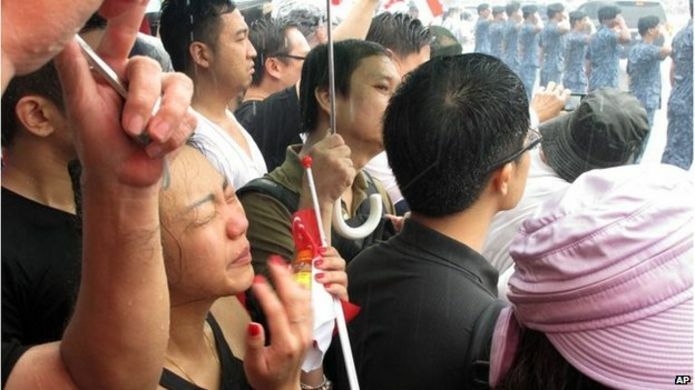 It was a scene unlike any other in practical-minded Singapore: a mass demonstration of pure emotion. 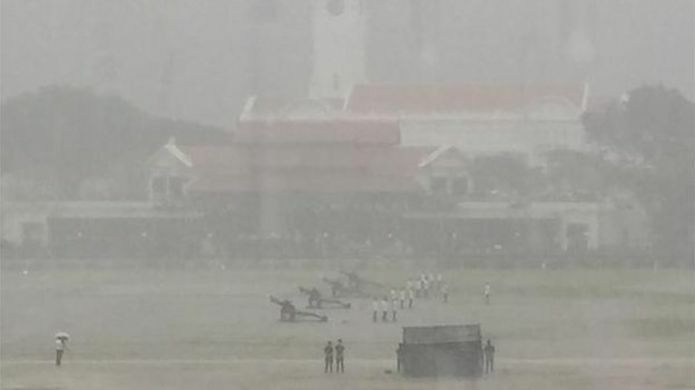 As the funeral procession rolled into view at the Padang outside parliament, the chants and cheers grew louder from the thousands clad in black waiting in the downpour. Some wept, and people began shouting, "Thank you Mr Lee", "Goodbye", "Take care", and a refrain from Mr Lee's speech at the same spot 50 years ago declaring Singapore's independence: "Merdeka", meaning "free" in Malay. At the Tanjong Pagar Community Club, hundreds more gathered to watch a screening of the funeral service. Many had come from elsewhere as they knew it was Mr Lee's constituency. "He was a great man. Nobody can replace him," one 60-year-old man told me. Singapore has seen increasing political and social divisions in recent years as it grapples with inequality and demands for political pluralism. Even Mr Lee's death spurred debate online with critics fearing that idolatry would sweep his controversial human rights record under the carpet. But on Sunday, the country came together briefly for a rare show of grief. Foreign leaders in attendance included former US President Bill Clinton, Indian Prime Minister Narendra Modi, Indonesian President Joko Widodo, Japanese Prime Minister Shinzo Abe, Australian Prime Minister Tony Abbott and UK House of Commons leader William Hague. In his emotional eulogy, Prime Minister Lee said that although his father had not lived to see Singapore's 50th anniversary celebrations later this year, the country could be proud he had "lived to see his life's work come to fruition". He cited the famous epitaph for Sir Christopher Wren, architect of London's St Paul's cathedral: if you seek his monument, look around you. "To those who seek Mr Lee Kuan Yew's monument, Singaporeans can reply proudly: 'look around you'," he said. After eulogies from nine other leading figure, sirens sounded across the city to mark the beginning and end of a minute's silence. Singaporeans were asked to recite the national pledge of allegiance and join in singing the national anthem. The coffin is now being carried north to the Mandai crematorium. Even after he stepped down in 1990, Mr Lee remained hugely influential in political life and was held in deep affection by Singaporeans. He oversaw Singapore's independence from Britain and separation from Malaysia. He was widely respected as the architect of Singapore's prosperity - the city-state's GNP per capita increased 15-fold between 1960 and 1980. However, he also introduced tight controls, restricting freedom of speech and of the press. Political opponents were targeted by the courts.